Set to debut as San Diego’s new ‘arts hotel,’ The Barracks Hotel will build on the success of Liberty Station’s newly branded Arts District with the intention of fashioning an ambitious union of art and hospitality. The concept comes together through a creative collaboration between one of San Diego’s leading developers, McMillin, locally based hospitality group, Untitled Hospitality (who is also behind the recently-announced Stone Hotel), and Liberty Station’s non-profit NTC Foundation. Liberty Station’s 90+ room specialty hotel will be co-owned and operated by Untitled Hospitality, whose CEO, Robert Cartwright, boasts more than 20 years of experience in operations and business development for leading global hotel and leisure companies, including Starwood Hotels & Resorts, Hilton, Marriott, Intercontinental Hotel Group and Key Hospitality Group. McMillin & Untitled Hospitality are working with locally based architect, Chris Bittner of obr Architecture, to spearhead the design and construction of the property. 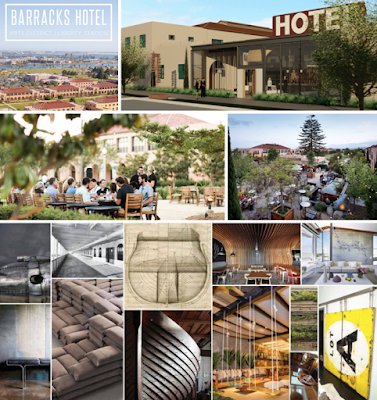 "With The Barracks Hotel, we’re taking an unconventional approach in reviving Liberty Station’s deep-rooted history," stated Robert Cartwright, CEO of Untitled Hospitality. "We believe the best way to honor the past is to make it personally relevant in the present. Through the concept’s artistic design and modern amenities we aim to create a truly authentic sense of place - after all, we hope to fashion a stay with history, not a stay in it." An award winning-model for the mixed-use conversion of military bases throughout the country, Liberty Station has become one of San Diego’s most distinctive neighborhoods. The multi-million dollar build out of The Barracks Hotel will restore eight of the ten remaining buildings slated for historic preservation within the Liberty Station neighborhood. Construction on four barracks buildings, three officer’s quarters and a former steam pump house will begin mid-2017 with a projected completion date for the hotel in late 2018. As a proud emblem of the local community, The Barracks Hotel will advance the work of property leaseholders, NTC Foundation - whose mission is to promote San Diego’s creative community by providing a home to the city’s most innovative and creative arts and culture organizations. With art as the primary focus, The Barracks Hotel will immerse visitors in both the artistic process and also the final result. From the lobby to the gardens, the pool deck to the guest rooms, both curated and site-specific works will surround guests as they sleep, eat and even check-in and out of this stylish and inspiring standout. "This new arts hotel on our campus will be San Diego’s newest gathering place for locals and travelers, and it will increase the overall value of the burgeoning Arts District as a visitor destination bringing thousands more people to the project to enjoy the arts, culture and culinary offerings," said Lisa Johnson, President and CEO of Liberty Station's NTC Foundation. The Barracks Hotel ushers in a new chapter for one of San Diego’s most influential developers, The Corky McMillin Companies. A new company, which is simply named McMillin, is led by the father-son duo, Scott and Andy McMillin, who will team together to prolong the well-respected reputation of The Corky McMillin Companies. "McMillin is very proud of the success we have achieved at Liberty Station," commented Andy McMillin, CEO of McMillin. "We are pleased to be working with the NTC Foundation on this project, and we are excited and optimistic about our new partnership with Untitled Hospitality on The Barracks Hotel. Together, we feel this project will create a sense of place that enhances community, generates memorable experiences and brings about inspiring moments for both our guests and our visitors." The Barracks Hotel will be located within the Arts District of Liberty Station. For more information about The Barracks Hotel, visit barrackshotel.com.